A rich and filling soup made with cashew cream, mushrooms and sweet black olives. I love creamy soups and the mushroom one is defiantly one of my favourites. I came across a similar recipe a few months ago and have made it a few times since then, with slight variations. 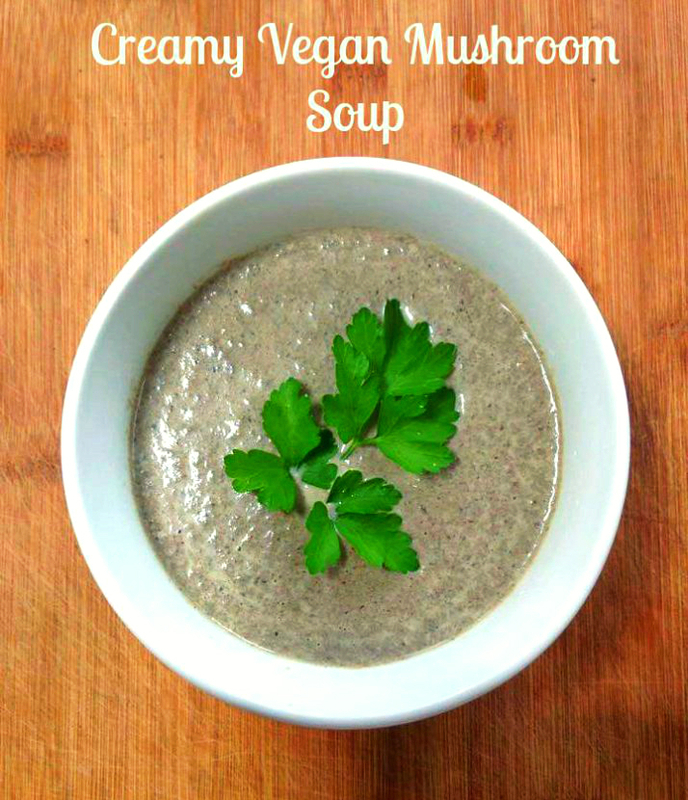 If you are vegan, vegetarian or simply want to reduce your dairy intake, this soup is a great option for you. Never mind that it’s summer, creamy soups are great at any time of the year if you ask me. Here in the UK, for example, the weather is so changeable during the summer season that some days are just perfect for something more hearty and warm. What’s more, this soup is very nutritious. Cashews are rich in ‘heart-friendly’ monounsaturated fatty acids, that help to lower LDL-cholesterol. They are also a source of vitamins (B complex) and essential minerals such as manganese, potassium, copper, iron, magnesium, zinc, and selenium. As for mushrooms, they are also good source of the many essential nutrients listed above and more, including vitamin D. According to studies mushrooms have anti-inflammatory and anti-cancer properties. Place the cashews in a large bowl and cover with boiling water until they are fully immersed. Leave to soak for at least an hour. In a large pot add the olive oil and sauté the garlic and mushrooms until translucent. Reduce the heat to medium, then add the olives and simmer for further 10 minutes. Drain the cashews. Place in a blender together with the soy milk and blend until smooth. Add the mixture to the pan with an extra cup of boiling water and stir. Season with salt and pepper. Blend the soup until creamy. Serve warm, garnished with fresh parsley leaves.